SanDisk - Clip Sport Plus 16GB* MP3 Player - Black. Shipped with USPS First Class Package. Open box. Box has been opened, but it appears that the plastic covering has never been opened. Scratches on the screen and case. Also subject to change especially during peak periods. No other accessories are included. See pictures for more details. SanDisk Sansa Clip Red (2 GB) Red ( 2 GB ) Digital Media Player. Condition is Used. Shipped with USPS First Class Package. EXCELLENT CONDITION WORKS PERFECT! EVERYTHING INCLUDED WITH ORIGINAL SOFTWARE AND MANUALS! HIGH BIDDER WINS FREE SHIPPING! 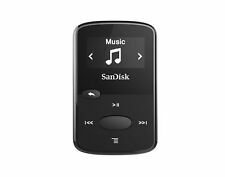 SanDisk Sansa Clip Black (2 GB) Digital Media MP3 Player W/ Apple Earbuds. Shipped with USPS First Class Package. Player is in good shape and appears to hold a good charge. Comes with the new old stock ipod earbuds as shown. Please ask if you have any questions. Thank you for viewing. SanDisk Sansa Clip 4GB FM/MP3 Player Silver Includes Music Player is in working condition and good battery life. Face has a crack in it. Please see all pictures of item and condition. Thank you. This Sansa Clip is in very good used condition. Sansa Clip Sandisk Mp3 Player 1gb. Black. Sealed contents. Sansa Clip Sandisk Mp3 Player 1gb. Black. Sealed contents.. Shipped with USPS First Class Package. Certified refurbished from SanDisk. Sealed in refurbished box. Includes all original accessories. SanDisk Sansa Clip Black ( 4 GB ) Digital Media Player.In good working condition. Shipped with USPS First Class Package. New Open Box. If there was a disc inside, it is gone. Also, the main unit doesn’t appear to have any wear and has the original display sticker on the screen. I did not remove the main unit from the secondary plastic container, but did open the main box to verify the condition. Also the microSD slot of this SanDisk Sansa digital music player lets you expand the storage capability, supported both microSD and microSDHC cards(cards not included). 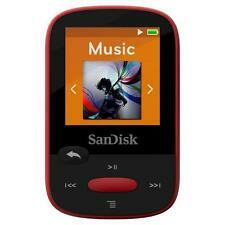 SanDisk Sansa Clip MP3 Player 4GB/1000 songs MP3/Voice Recorder/FM Radio/with microSD slot, all in one Device. It is compatible with a wide range of high-fidelity formats, including FLAC and Ogg Vorbis, and it features a built-in FM radio and microphone. · Color: Black. · Compatible with a range of audio formats. SanDisk Sansa Clip 4GB MP3 Player. 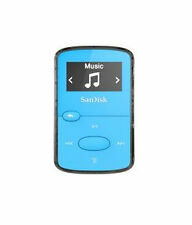 SanDisk Sansa Clip MP3 Player 4GB/1000 songs MP3/Voice Recorder/FM. Refurbished SanDisk Sansa Clip 4gb Player(Sliver). FM Stereo Tuner, Radio Recorder, Voice Recorder. SanDisk Sansa Clip Zip. Includes USB cord, instructions and disc. Has 8GB storage. However, we do make mistakes. New unused, 4gb is stated on box item is only 2gb but it is expandable up to 32gb with SD card. This listing is for an SanDisk Sansa Clip 4GB MP3 Player - FM Radio - Voice Recorder (Black). This has been tested and it works great. I offer a 30 Day Warranty! Actual item pictured is the one you will receive. This shows some wear such as scratches and scuffing. Please refer to photos for actual conditon. This comes with the Sansa Clip & USB Cable ONLY. NO HEADPHONES INCLUDED. Serial #: BH0809BGHK 100% Authentic Guaranteed. Tested and works. Very good condition. 4GB storage. See pictures. Digital FM tuner with 40 presets. Built-in clip for easy carrying. 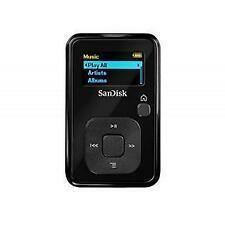 SanDisk Sansa Clip Plus Black 4GB MP3 Player with microSD card slot. Condition is Used. Shipped with USPS First Class Package. 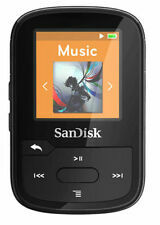 Title: SanDisk Sansa Clip 1 GB MP3 Player Black Mini. Details about the item: Very Good Condition SanDisk Sansa Clip 1 GB MP3 Player Black. Model: Sansa Clip . Type: Mini Clip Player. Signs of wear can include aesthetic issues such as scratches, and discoloration. 5 out of 5 stars - SanDisk Sansa Clip Sport BLACK (4GB) Digital Media Player NEW IN BOX! 1 product rating1 product ratings - SanDisk Sansa Clip Sport BLACK (4GB) Digital Media Player NEW IN BOX! IN THE BOX. Drones - All defects can be handled under the manufacturer's warranty. How long does it generally take to process an order?. The manufacturer will generally repair or replace the item so long as it is under warranty. Bluetooth technology lets you connect wireless headsets, and the water-resistant design is ideal for outdoor use. SanDisk Clip Sport Plus. Radio FM tuner. Allows playing of your favorite FM stations.